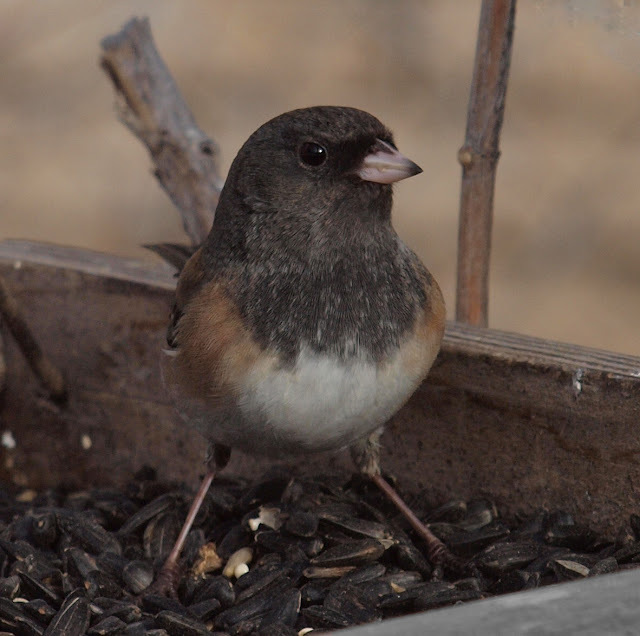 Great shots of the Junco..so is this your new backyard? Nice shots! Mine are always camera-shy. Beautiful juncos!! Quite different from the slate-colored ones. I guess yours are the Oregon group. @Dawn - yep, this is from my new backyard in Bountiful, Utah. Lovin't it! @Halcyon - thanks for the nice comment. I was actually draped in a camouflage sheet standing next behind a tree near the feeder. I used a 150mm lens with the sun directly behind me. Otherwise they are usually too shy. 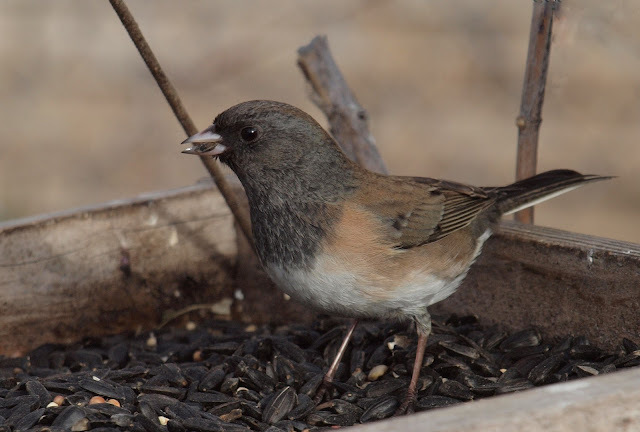 @Hilke - these are indeed the Oregon race of Dark-eyed Juncos. Super Junco images! One of my favorite birds. At this moment, we have 7 Dark - eyed Juncos enjoying seed at our feeders. Such pretty birds. Wish I could get photos as wonderful as yours. Fantastic close ups! @Julie G. @YsMum @Anna - thanks for visiting and leaving the nice comments! Juncos are really cool and it was fun to get this close for photos in decent light. The Salt Lake area hasn't had many sunny days recently. 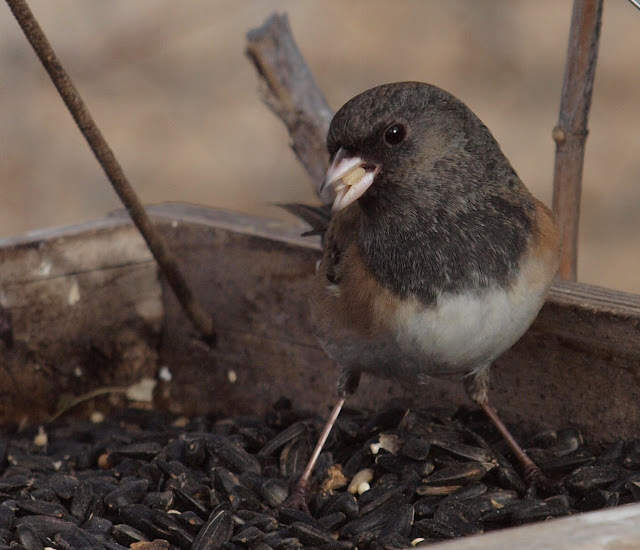 Great shots of the junco. They rarely come to my yard and never cooperate for a good photograph. 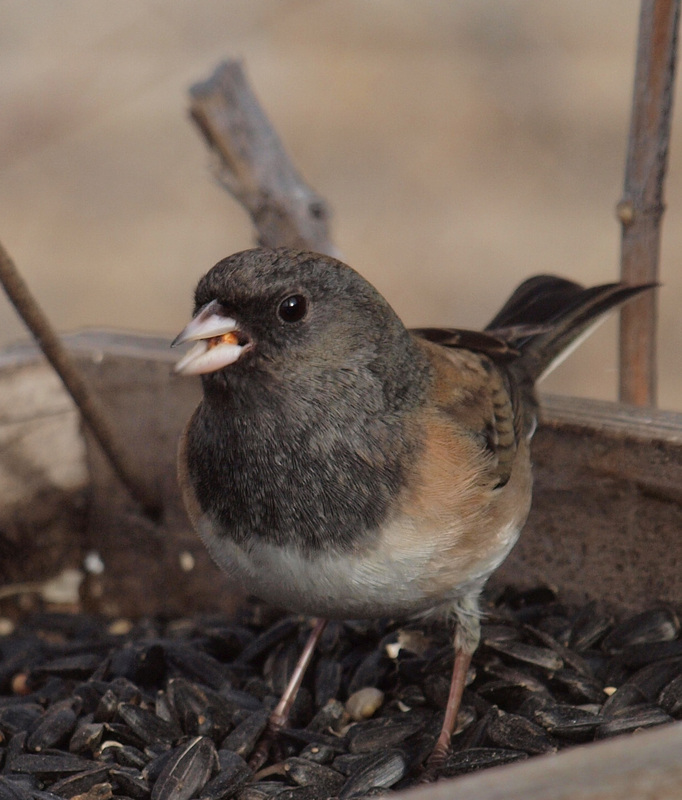 Nice shots- gotta love the juncos! @Martha Z. @Mike B. - thanks for the comments! This certainly was the most cooperative junco I ever saw. I always enjoy looking at photos and videos of Dark-eyes from around the country. I see the Slate-colored subspecies, which looks like a completely different bird in terms of plumage. But I guess juncos from all around the US behave similarly! @Owler - thanks for commenting! A few days ago I posted about a Slate-colored Junco that came to my backyard. I saw them a lot when I traveled the east coast. More beautiful shots Robert! I love the snow birds and have many gracing my yard this time of year. Last week I posted a photo of a Dark-eyed Junco putting on the brakes as it approached the suet feeder that was occupied by a much larger Acorn Woodpecker. 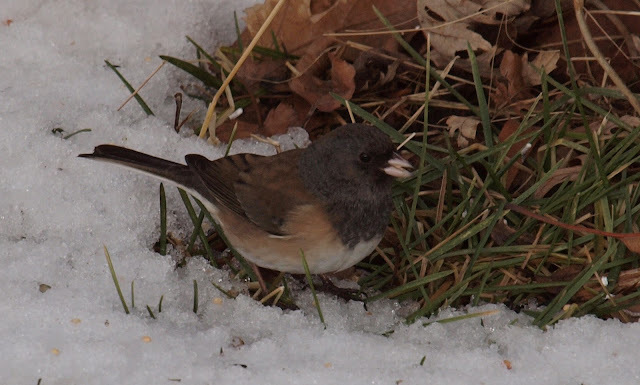 Thanks for sharing these gorgeous photos of your Dark-eyed Junco. I'm amazed how different the Junco looks out west compared to the ones I see in Indiana. Ours are definitely the slate colored ones. Great shots of them!